Credit: Photo by Tim Dwyer, courtesy of ARCUS. Scientists have wondered for decades why marine animals that live in the polar oceans and the deep sea can reach giant sizes there, but nowhere else. University of Hawai’i at Manoa zoology PhD student Caitlin Shishido, with UH researcher Amy Moran and colleagues at the University of Montana, went to Antarctica to test the prevailing theory-the ‘oxygen-temperature hypothesis’-that animals living in extreme cold can grow to giant sizes because their metabolisms are very slow. The animals they studied were sea spiders, marine relatives of land spiders that breathe through their legs. “We were amazed that not only could the giant animals survive at much higher temperatures than they usually see, but they dealt with warm temperatures just like the smaller ones,” Shishido said. “That’s not supposed to happen; larger animals should exhaust their oxygen supply and run out of gas much sooner than small ones.” This should be especially true for sea spiders, which are ‘skin breathers’ – they have no gills or lungs to help get oxygen, but have to rely on diffusion across the surfaces of their legs. 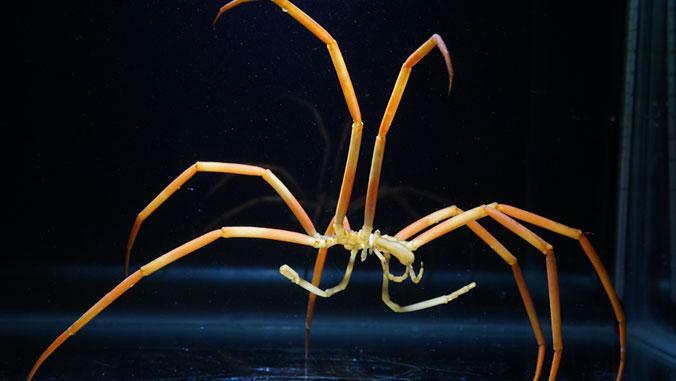 How do giant sea spiders appear to get around the laws of physics? This was a mystery, until Shishido and Aaron Toh, a UH undergraduate student, used microscopes to look closely at their legs. The legs of sea spiders are covered with pores, and the researchers found that as the sea spiders grow, their exoskeletons become more and more porous. “The exoskeletons of the really big ones look almost like Swiss cheese,” said Shishido. This work was funded by grants from the Division of Polar Programs at the National Science Foundation.